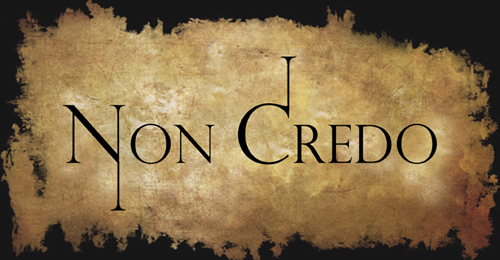 Non Credo is the Los Angeles based duo of multi-instrumentalists/composers Joseph Berardi and Kira Vollman. Primarily a percussionist and vocalist, respectively, their musical palette with Non Credo extends well beyond the scope of their primary instruments. Clarinets, marimbas, accordions, cellos, broken down keyboards, cheap electronics, altered children’s toys and anything else that falls into their path are utilized. Nothing is sacred, nothing is wasted. Kira’s voice displays a remarkable range, both tonally and emotionally, and their musical landscape is equally far-reaching. Their enchanting songs and evocative moods draw from all styles and eras of music, from contemporary experimental forms to Saturday morning cartoons, to film scores to pygmy war chants. But they can be equally excited by a page from Edward Gorey, a B movie full of smoke and fog, a twisted Bruegel landscape or an overheard conversation in a late-night diner. From gothic thriller to film noir haze to disturbed fairy tale, their audience is led on a journey with many detours and dark alleys along the way. Colorful characters inhabit their world, telling tales of the mundane elements of everyday life… greed, lust, hatred and crippling fear. You are never sure where this journey will lead, but be prepared to get seasick, be beaten up, thrown in jail, fall in love, contract an STD, have your heart broken, your wallet stolen, get shanghaied, hog tied and crucified. You may not like where they’ve been taken you, but you are forced to pay attention. It is not meditative or passive. It is not background music, and any attempts to make it such will result in frustration and annoyance on the part of the listener. Comply and you will be rewarded. 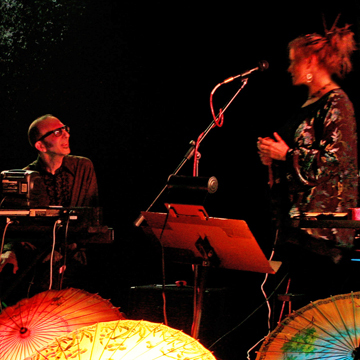 The musical collaboration between Joseph Berardi and Kira Vollman can be traced back to the 1980s with a project they called HumDrum, a duo of strictly voice and percussion. Seeking to expand, they invested in recording equipment and began to layer in other varied instruments that each of them played and Non Credo was born. This led to a compositional style that is totally integrated with and dependent upon the performances of the composers. They are interested in the expansion of the song form, creating atmospheres around a set of lyrics in a sometimes cinematic way. Non Credo’s debut LP, “Reluctant Hosts”, was released in 1988 by No Man’s Land, the German affiliate of Recommended Records, and re-released on CD in 2000. In 1995 they released “Happy Wretched Family” on the noted Canadian label, Les Disques Victo. Their third CD, Impropera, an improvised, improper imp opera, was released in 2006 on the French Progressive label Gazul/Musea. They have also appeared on several CD compilations in Europe and the USA, and have composed music for film, radio, dance and performance pieces. They have performed in galleries, theatres, museums and rock clubs, and have played New Music festivals in the USA, Canada (Musique Actuelle) and Europe. These powerful live performances mix song with improvisation, always paying close attention to their keen sense of structure. Their improvisations usually take the form of “instant compositions”, rather than freeform ramblings. Unlike some improvisation, Non Credo knows when to stop.